The introduction of new e-book readers such as the Kindle by Amazon, Nook by Barnes & Noble and the iPad by Apple, have brought on a nearly insatiable demand for new content and have made e-books the fastest growing segment of the book publishing industry. Authors and book publishing companies are rushing to publish new content and convert regular paper books to the new e-book digital formats for use on the most popular e-book readers. Say Out Loud, LLC offers a complete suite of book publishing services tailored to the needs of authors. Services include editing, illustrating, eBook conversion, printing, marketing, distribution and book promotion. Submit your manuscript to [email protected] in PDF or MS Word format. Our team of experts will review your manuscript and provide a price quote for printing and / or digital conversion and publishing. Prices depend upon book formatting, number of images and graphics. 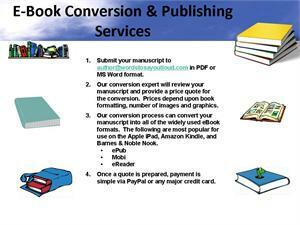 Our conversion process can convert your manuscript into all of the widely used eBook formats such as ePub, PDF, eReader, Mobi, etc. These formats are most popular for use on the Apple iPad, Amazon Kindle, and Barnes & Noble Nook.